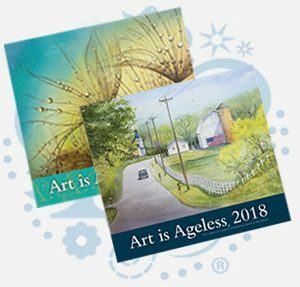 In 1981, Presbyterian Manors of Mid-America featured resident art in the first Art is Ageless® calendar. The program was born out of PMMA’s desire to reaffirm “the agelessness of human creativity” and to actively demonstrate that “when it comes to human worth, it is the mind and spirit – not age – that counts.” The sentiments were expressed by former PMMA president, Rev. Thomas C. Wentz in the inaugural calendar. PMMA’s mission to provide quality senior services guided by Christian values encompasses all aspects of health – physical, mental, social, emotional, environmental, occupational, spiritual and educational. Each person who participates in Art is Ageless reaps the benefits. Artistic pursuits have been proven to increase the health and well-being of older adults. In a longitudinal study funded by the National Endowment for the Arts and conducted by George Washington University in Washington, D.C., study participants who were actively engaged in artistic pursuits creating original artworks reported a reduction in doctor visits, less medication usage, positive mental health and an improvement in overall physical health. “Staying Engaged: Health Patters of Older Americans Who Engage in the Arts” looked at older adults who either create art or attend arts events, do both, or do neither, and the health differences across these groups. The report is based on a Health and Retirement Study (HRS) conducted by the University of Michigan with support from the National Institute on Aging within the National Institutes of Health. Questions about arts participation habits and attitudes toward the arts were added to the survey questions in the study in the 20+ year longitudinal study. Older adults who both created art and attended art events reported higher cognitive functioning and lower rates of both hypertension and limitations to their physical functioning than did adults who neither created nor attended art. Cognitive function scores for those who both created and attended art were seven-times higher than for those who did neither type of arts activity. PMMA communities offer many opportunities for residents to express themselves through creative endeavors. Culinary arts, writing, painting, drawing, jewelry making, craft projects, music, theater and more are celebrated on our campuses. Many communities bring in local professional artists to work with residents. Other classes are started by residents and employees.